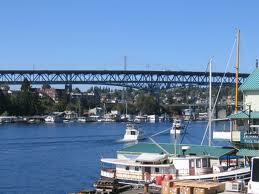 Today’s walk – two hours, around Lake Union. The sun was shining and my legs are sore. I’ve not been doing well at keeping up with daily thoughts or even slightly less frequent thoughts during the last of these 40 days. And I’m only feeling some slight Catholic guilt about that. 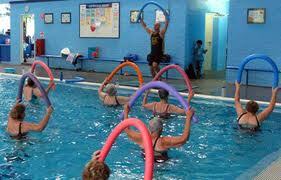 Since I last reported in, I’ve hit yoga and also did a few rounds of aqua aerobics (!). I haven’t hit my bicycle yet, though the time is coming soon. I jotted down some thoughts or a few words about the recent chant from yoga: Shiva shiva shiva shambo. According to a site that I found online, Shiva is pure consciousness and the realization of our nature as infinite or immortal, never born or dying. Thoughts that I take away from yoga, in general, are to try and not let things affect me as much. I’ve got a ways to go in mastering that concept. And while I’d love to not let the thoughts that bring me down get to me as much, the thoughts that send me in a more ecstatic direction also come to mind. How could I not be excited at seeing a celebrity in class, as an example? I get as giddy as a teenager and it feels wonderful and silly for days. The dilemma of being more zen. The pool at my gym is being repaired and it’s shut down for a few more days. But I was happy to get in a few more aerobics classes there before the repairs began. The last time I hit class, I swam laps for about 10 minutes before class. The Saturday class could be a new favorite, and was more intense than the first class I hit during the holiday weekend. The music was more modern, too, and included Adele and the Lumineers along with some Train. No more sweating in the water to the Oldies. There’s now only three more days left in this challenge. A real work-out will be challenging in the next few days because of plans after work, but it’s entirely possible that I can finish out strong on the 40th day. And I’ve got other non-40 day thoughts on my mind after watching Girls tonight and thinking about what I really want to do in life. And feeling more inspired than I was earlier today, after reading several depressing stories in the New York Times. I got two … count ’em … two workouts in yesterday, on a day off from work. And it felt pretty fabulous. I decided to hit an aqua aerobics class at the gym (photo example left, of course) because I was curious and also thought it could be a good workout. It had been years since I took that type of a class; the last time was at my parent’s condo pool with my mom and some of her neighbor friends. I was one of two younger-ish women in a class of 25 to 30 students. At 11 a.m. on a Monday, I didn’t expect a lot of younger people. We aqua’d to the oldies, if you will, doing sprints, lunges and twists to dance-ified versions of “Under the Boardwalk” and “Jailhouse Rock.” I could barely hear the music during most of the class, but the instructor was great in providing encouragement and keeping us going during the 60 minutes of class. She stayed on the deck the entire time and I know she’s the teacher, but she was pretty impressive in mixing it up and even providing some in-water stretching at the end. The heater was broken, which made for a chilly entry into the pool but I and others obviously survived. I hadn’t then planned on going to yoga, but my friend, L, wanted to meet up because she didn’t get her workout in earlier in the day. 90 minutes with Steve, who shared thoughts about equanimity at the start of class. It sounds like a tricky thing to strive for though it’s been discussed before in class in different terms – not letting either pain or pleasure really rattle you. It seems like the ultimate in reaching a zen and Buddhist state, too. And now, on to today. 30-ish minutes of walking, including a nice long walk in the middle of the day, when the sun was shining here in Seattle despite the cold. 10 minutes of the walk today came at the end o’ day, walking with D. from the office to vehicles parked offsite. Here’s hoping we’ll have more sunny days during the rest of the week. I’m pretty psyched about the way I’m closing out this second half of the 40 days. Yoga yesterday, and today – 90 minutes each class. I feel great. My torso is sore in a good way from the twisting and core work (thank you, Liz). Earlier in the week, I made sure to walk every day. Of the highlights, on Monday, I took a walk to the University District to pick up a prescription. 40 minutes round trip. I was still feeling the effects of the surgery, and while peeking gently at the gum graft sites, I worried a bit about whether I might have an infection. Turns out, now that it’s healing up even more, it was just the sutures on the left side of my mouth that looked like an infected wound. Gross, I know. And I also figured out that if I really did have an infection, it would have been hurting and not just looking like something was wrong. My periodontist said right before the surgery that it was great to see a patient that had so much saliva flowing. She said that most of her patients are on so many medications, it dries up the saliva. Not something I’ve always thought about being thankful for, but it was a nice reminder that I am healthy and not on a bunch of meds. On Monday, during that long walk, I took a cue from a scene in Liberal Arts. The main character walks around listening to opera, and he comments on how it has changed the way he views the city. In that scene, everyone looks at him and smiles (the scene takes place in New York City). I was listening to Mozart arias performed by Cecelia Bartoli. It’s a favorite disc of mine though I haven’t listened to it for awhile. Sorry to report that the music did not have the same effect on the people that I passed. Maybe one or two smiled, but one guy gave me a pretty quizzical look and a lot of people ignored me. So – interesting experiment but not quite the same results. My horoscopes have been strange and somewhat dark this week on Astro.com. On Tuesday, Feb. 12 the subject line was: Something is wrong. Yikes. On the one hand, some of what was in there is true – you’ll separate yourself from persons or circumstances that are doing you no good. But then it went on to say in the process, I’ll experience a considerable amount of tension, and that I may be confused for awhile. “You would be well advised to go off by yourself for awhile, because other people’s advice will be of little value, unless you select your advisors with great care.” The horoscope went on to say feelings of restlessness and uncertainty would be strong. I actually do feel some of that. 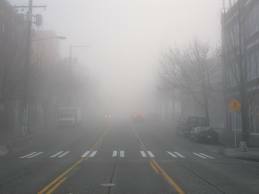 This is how I felt this a.m. when I woke up: Foggy. After having gum graft surgery on Friday (my second go-around with the procedure), I woke up this morning a bit disoriented and hazy. I had a surprisingly hard time falling asleep last night, and was concerned that any teeth grinding might disrupt the new tissue waiting to bind. And I say “surprisingly hard” because I went to a friend’s b-day gathering and stayed up later than the night before. My periodontist had said to wear my night guard, but I wasn’t sure if that would be enough to prevent damage. My mind was wandering, too. I took some ibuprofen to get rid of the slight ache in my lower jaw and ended up popping a pain pill that did help put me to sleep. Hence, the fog, I suppose. I watched a great movie yesterday with a wonderful soundtrack: Liberal Arts. The movie is set in both New York and Kenyon College in Ohio (though un-named in the movie), and it’s got a couple of really great quotes, including: “The purpose of fiction is to combat loneliness” (David Foster Wallace) and “Everything is okay,” from none other than Zac Efron, in a (unexpectedly) funny hippie role. The Kaiser Cartel plays a cool tune in the closing credits, and I now need to dig up my CD of theirs that a friend gave to me a few years ago. Yesterday, I slept in and went downtown to do a little shopping. My initial plan was to walk downtown (45 minutes, but I decided that it would be better later to do a 30-minute walk instead). I got a bit overheated and was concerned that I was fever-ish during the shopping trip, so I made my purchases at the Gap (new work bag, scarf and throwing out the old, worn ones) and headed home. I have higher hopes for today and plans to walk with a friend. I’ve lost 4 pounds already due to the “soft food only” diet. These were pounds that I really needed to lose, so this is all good stuff. The sun is coming out, too, and the fog is burning off. Coffee is kicking in, and the Hoosiers are on TV, up on Ohio State at the moment. I feel like I hit another slight and extended bump in the road in my 40 days with this surgery but also know today is another day, and I’ll get done what I’m able to. Everything is okay. One-quarter of the way through, and it’s working (or I’m working; smile). 90 minutes of yoga on Monday night and last night, a 45-minute walk home from work. The latter was not planned, but the cool air on my face, with a little fall of rain at first, felt so nice after being inside nearly all day. On Monday night, Steve started out class by talking about pranayama. As he explained and as you’ll see on Wikipedia, the word is composed of two Sanskrit words, Pran, meaning life force (particularly, the breath, which we need more than food and water) and yama, to extend or draw out. We did some kapalabhati, or breath of fire, which is basically short, explosive exhales through the nose. I’ve realized recently that it really gives your abs a workout, too. Tuesday night, I walked to REI after work to get new swim goggles (no more raccoon eyes). The cool-ish air and almost rain felt nice on my skin. The walk to REI was around 10 minutes or so, and I knew the total walk home was 45 minutes. So after REI, I walked it all the way home, and it felt pretty great. I’m slightly obsessed right now with a song from Glee (“This is the New Year”) and I kept hitting repeat while walking it (and me) home. First, it was skin care. And now, my social life is cramping my exercise routine. But, wait, perhaps instead… my social life is helping me reframe my exercise routine. I also now realize that on many days, I can easily meet the 30 minutes goal. Yesterday, I had plans to meet friends after work to watch the IU-Purdue game. Eric, a friend I’ve known since high school, was in town for training with his job (Microsoft). Celeste, a friend I hadn’t seen for awhile and who is also from Indiana, was meeting us along with Eric’s friends from work. I had brought clothes to work to change into and climb up some hills as a break during the day, but that didn’t happen. Luckily, the walk from the bus to the bar (Buckley’s in Belltown) was a good 15 or 20 minutes, at a brisk pace (X two, since I caught the bus home at the end of the night, too). Today, I had a non-rehearsal rehearsal dinner to attend shortly after work. I took yoga clothes to work but the class in my building is no longer happening. Drat. But I also had a dentist’s appointment downtown in the morning. Walk there and back: Approximately 30 minutes. And instead of yoga at home before dinner, I tried a 15-minute DIY barre workout from Daily Candy and Andie Hecker, celebrity trainer to Miranda Kerr, Ginnifer Goodwin and Natalie Portman. Hecker’s Ballet Bodies site is inspiring photog-wise and perfect for me, the one who is craving dancer’s legs. So there you have it. I’m still on target for the 40 days. I’m a little worried about tomorrow, since I am leaving work early for a wedding and am not sure I’ll have time for a workout during the day. Plus, I have to haul the party dress to work. Do I want to also bring workout clothes, or can the workout be the dance party after dinner? We are also walking to the courthouse for the wedding – could that perhaps be a 30-minute walk, total? See – social life dilemmas hit me once again. I have a feeling I’ll be ready for the weekend, and some actual gym time. Short-term goal: Finally hit the pool.